Mean plasma glucose (A), insulin (B), and C-peptide (C) are depicted before (–15 and 0 minutes) and after (15, 30, 60, 90, 120, 150, and 180 minutes) ingestion of a standardized test meal. P values refer to group comparison of areas under the concentration curve (AUC) before (black line) and after (gray line) mirtazapine treatment (AUC glucose: 15,366.9 mg/dl ± 2,390.4 SD vs. 16,515.6 mg/dl ± 1,726.7 SD; t = –1.593; P = 0.146; AUC insulin: 777.6 μU/ml ± 357.0 SD vs. 1,086.8 μU/ml ± 404.0 SD; t = –2.423; P = 0.038; AUC C-peptide: 168.8 nmol/l ± 36.7 vs. 196.9 nmol/l ± 34.6 SD; t = –2.769; P = 0.022 (paired t test; n = 10). Error bars are standard errors of the mean. A medium to high effect (change score; see ref. 18) was found for the change of the AUC for insulin and C-peptide (0.77 [0.65–0.89] and 0.88 [0.74–1.01], respectively). The effect sizes for the change of the glucose AUC was 0.5 (0.41–0.6). 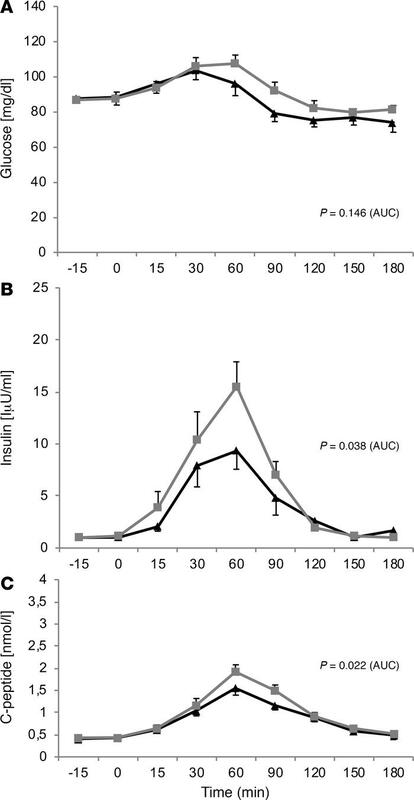 In a 2-way repeated-measures ANOVA with a Greenhouse-Geisser correction, we found significant effects of mirtazapine for insulin and C-peptide (F[1, 9] = 6.69, P = 0.029 and F[1, 9] = 8.56, P = 0.017, respectively), but not for glucose (F[1, 9] = 2.27, P = 0.166). The time effect was significant in glucose, insulin, and C-peptide (F[7, 63] = 22.56, P = 1.14 × 10–8, P = 0.029, (F[7, 63] = 16.94, P = 2.95 × 10–5 and (F[7, 63] = 41.09, P = 1.86 × 10–8, respectively) while the mirtazapine × time interaction effects were not significant (F[7, 63] = 1.78, P = 0.188, (F[7, 63] = 2.41, P = 0.092 and (F[7, 63] = 2.01, P = 0.138, respectively). Bonferroni-corrected post hoc tests of mirtazapine × time effects were not significant for any laboratory value.